Laredo, TX – The Webb County Heritage Foundation will host a book-signing with Jane Clements Monday, co-author of “Dr. 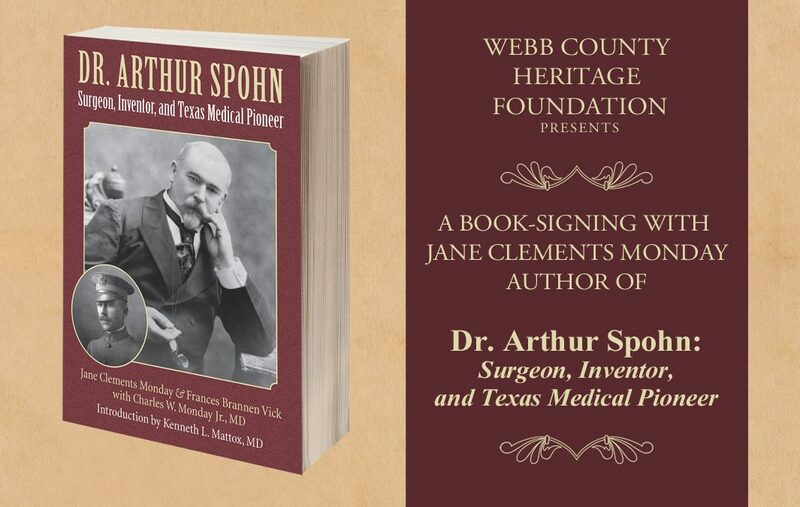 Arthur Spohn: Surgeon, Inventor, and Texas Medical Pioneer” on Wednesday, November 7 from 6 to 8 p.m. at the Villa Antigua Border Heritage Museum, 810 Zaragoza St. in Laredo. A presentation by the author will take place at 6:30 p.m. Books will be available for sale that evening. The Spohn Ranch, located just outside Laredo, is still in the family today. Spohn’s extended family played prominent roles in Laredo’s social, professional, and political history, and presently include Randolph Slaughter, Jr., a current board member of the Webb County Heritage Foundation. Jane Clements Monday is the author of numerous books and co-author, with Frances Brannen Vick, of award-winning Petra’s Legacy: the South Texas Ranching Empire of Petra Vela and Mifflin Kenedy and Letters to Alice: Birth of the Kleberg-King Ranch Dynasty. She has served as chair of the Texas State University System Board of Regents and mayor of Huntsville, Texas, and is a distinguished alumna of the University of Texas. She resides in Huntsville.